Hey! I found your blog last night as I was googling. I too struggle with overeating. I have been on a chronic dieter and lately all it’s doing is driving me crazy! I was wondering where you are now in your journey. What foods are you staying away from? I feel like I will probably have to do something drastic to find victory and freedom. I just don’t know what to do or how to stick to anything. I’m on a bit of a struggle myself right now to be perfectly honest! I have found though that when I stick to the foods on my list (thecovenantdiet.com/what-i-eat) I’m totally golden! But that’s the hard part. Notice how I said I’m golden WHEN I stick to the foods on my list! I get caught up in the three-day-diet cycle… I can stick to it for three days and then I crater and then I eat like crap for four days (cause everyone knows that you can’t start anything until a Monday, right??? Ha!). When I made the commitment originally and I committed for a year, I was totally great… it was almost easy… but then as soon as I was “done” with that year I started to do that justification game with sweets: “Oh it’s a special occasion.” or “Oh I don’t really have any good food in the house” and my fav “Well, I already messed up for the day so might as well go for it!“, etc. But then it got to the point where I stopped caring… even if I committed my eating and my nutrition to God. I think my subconscious knew that the main reason I was committing to God was only because I wanted to get the weight off again – not that I actually cared what God thought. I need to get myself connected with God through habitually meeting with Him every single day. I don’t even care that I don’t care! Okay, well, I sorta do care about that one a little. I guess that’s why I’m writing this. But what I do know is that my soul won’t change… my soul won’t care unless I go to The One that made my soul. The One who crafted me. The One who genuinely cares that I… care. Will meeting with Him every day “fix” me? Geez. I dunno. Will meeting with Him every day help to realign who I am with what I am meant to be: a blessing? Well, it is certainly a start. I need some encouragement to do that! I don’t have anyone in my life that I am committed to in that regard… maybe one of you will commit with me. I don’t know… maybe we can make one of those facebook groups or something? Some place… some people… where I can be reminded every day to go to Him who will remind me every day that I am intended to be a blessing and where I can remind you that you are intended to be a blessing. Where we can remind each other that we love the Word of God. That we NEED the Word of God. Where we can remind each other that a focus on Him is a blessing to us and then that’s a blessing to the world. To be told time and time again that this food thing is only to distract us from our purpose. I totally feel like I’m putting out there some kind of “Will you be my friend” plea or something! Haha! But, hey, why not?!?!?! Will you? Will you be my friend? I’ll be your friend! We can help each other look to God… I just know it. What do you think??? Maybe, comment on here if you have an idea or would want to “be my friend” (haha)… or if you are on facebook or twitter let me know on there by commenting on a post or replying to a tweet. Let’s see what we can figure out! Lately I’ve been continuing to think about what can I do to help me get back on track. Well, to get back on track faster. I know that I’m on the right track of fighting back against my issues with food, but admittedly, I just want to be over it… faster. So I tend to want to go back to how I did things at the beginning: by fasting for a few weeks. But then my brain is all like “No, you need a total 100% lifestyle change!” but, honestly, I am so daunted by that. The rest of my life… to commit to eating healthy without sugar for the rest of my life!?!?! It’s such a HUGE commitment. So instead, I just avoid it. I eat MORE junk than I would have normally. Cause… yeah, like that’s gonna help. I’m afraid of making a huge commitment of “sacrifice” so what do I do? I run from it. So, I say that to Him now. God, put me back on Your path. Allow me, as Jonah did, to see your undeserved grace and mercy. I ask that, as with Jonah, your grace and mercy would fall on me and on those who hear my story and hear your offer of mercy. Help me, God. Help me to choose your true life. Every Tuesday and Thursday, both my Kindergartener and my Preschooler are at school for about four and a half hours, and so I often escape away to a coffee shop (if you follow The Covenant Diet on instagram then you’re used to seeing my “I’m working” pics as proof for my husband that I am, indeed, working and not out shopping all day)! This past Tuesday, I went to La Madeleine to work (they have a great patio… with a plug for my laptop) even though I just felt like my soul was dry as a bone. I tried to work for, like two hours, with pretty much no result. It was like everything that was coming out of me was… blah. So, after a ginormous group of very loud, very talkative women came in and set up shop right next to me (despite the fact that there were, like, fifteen other tables to sit at), I decided to pack it up and go home and do chores so that I’d at least be doing SOMETHING productive. And on the way home, I got behind the slowest Walmart truck in all of creation and THEN got behind the slowest lawn mower truck in the world. I kept thinking… something is going on. Like, I feel like there is some kind of spiritual battle going on right now. Like, if my life was really like the book This Present Darkness and I could see the spiritual realm then I would see demons and angels battling it out all around me… for me. Well, my husband was sitting right inside the front door when I came home. Honestly, I wanted to just blow right by him… I was afraid that he and I would talk and I would miss out on what God wanted to say. But he needed to talk, and so I was deterred from my plan. And THANK GOODNESS because He’d been having some kind of major revival on his own while I was gone and he just started to pour out his soul to me… which basically caused me to have some kind of major revival… by association! When the joy of the Lord is around you, it’s just… awesome, no matter who He brought His word to in the first place. The whole thing was just a reminder for me… that, it’s not always about ME. It’s not always about MY spiritual walk. Sometimes God is at work and that work is not all about me. And honestly, that is just downright kind of refreshing. So… I feel like I gotta tell y’all. I didn’t really do the 7-Day Daniel Fast this last week. Well, I did… at the end. But not at first. I could give y’all a bunch of excuses, but it boiled down to: my husband went out of town Wednesday night and I didn’t go to the grocery store, so it just… didn’t happen. Some of y’all did do the Daniel Fast! And let me tell you… from the emails and messages that I’ve gotten from you that were blessed… guess what? And it is actually THE reason that I started this blog in the first place… because I needed help and I needed accountability. Everything was excessively UNflattering because nothing fit. I mean, we are talking about things that fit me a few weeks ago and on Sunday I was positively POURING out of them. But, like I said on Day 623: Perfectly Prepared, I trust in the slow work of God. And He worked through you. Because on Sunday afternoon, I got back on that wagon and, of course, immediately felt better. Immediately felt my mind turn to God. Immediately felt the freedom beginning to wash over me again. So. To you who encouraged me simply by sharing your love of the work of God. Retaliation: No, I really shouldn’t have those. Rationalization: I haven’t had an Oreo in so long. or I have eaten so well today, I deserve it. And what’s so dangerous about this is that after too many cycles of it, I often skip the most important step… retaliation. And when I skip that it’s often a sign that I’ll start jumping straight from Temptation to Capitulation. And to drown out any Retaliation that might start bubbling up through my conscience, I start to eat more. eat faster. eat ev.er.y.thing. This morning as my eyes shifted over at that bag of Oreos on the counter, I sighed and prayed: God. I just want to be free again. The entire reason that I’ve done this 7-Day Daniel Fast was to bring me back to that, and honestly, I’m pretty sure I haven’t prayed a single time since it started. In desperation, I prayed this morning. And it worked. It turned my attention away from those cursed Oreos… to Him. And that’s the cycle I want. I’m gonna even stop thinking it. Because that always seems to backfire. And then I have to LEARN something that God wants to show me. Okay, a bit of sarcasm about the “learning” thing there… I always LOVE that I had to learn something, AFTER I have “finished” the learning. And, well, for the past seven months I have been doing a lot of learning. A lot of learning, the hard way. I’ve been learning that God is not a quick fix. God is not a Weight Watchers plan. He is not Jenny Craig. He is not Atkins. South Beach. The Zone. The Lord of the Universe is not Slim Fast. God is not even a Daniel Fast, biblical though it may be. God is His own plan. And God has His own plan. And His plan is not made or designed or produced by us. His plan was intricately woven in Heaven. And as much as it hurts sometimes, His plan involves us going down painful roads. Roads of confusion. Roads of disappointment. Roads of trial. So, that’s why I made that insta-whatever-you-call-it today. (And puh-lease ignore my typo in it… I swear I proofread that thing a zillion times and still missed it!) Because it is so very, very important to remember in those moments of pain, confusion, disappointment, and trial… it is so very important to remember that GOD IS WORKING OUT HIS PLAN FOR YOUR LIFE. So when you can’t button those “fat jeans”… pray that He would help you. When the scale is ten pounds more than you hoped for… pray that He would heal you. 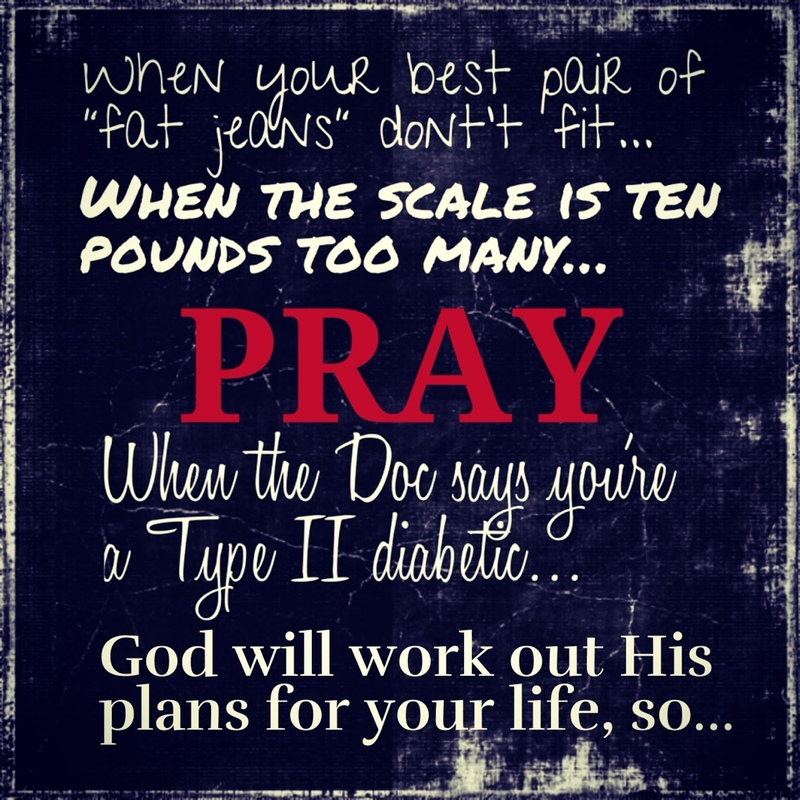 When your doctor tells you that you are now a type II diabetic… pray that He would guide you into health. Because God WILL work out His plans for your life. It is not over. Stay by Him. His faithful love endures FOREVER. Oh God, help me to see You as you work your plan for my life. Help me to know that your faithful love, God, that it endures forever. Please don’t abandon me, God, because you made me. I am yours. I pray that as soon as these words leave my lips that you will answer me and encourage me by giving me strength. I praise you now for your unfailing love and faithfulness. I give you thanks God with all that I am. Help me and guide me and love me. Oh God, love me. Amen. *By the way, not dissing those diets if they work for you… they were “quick fixes” for me, that’s why I listed them here. I recently had a major “purging” session with my blog friend finneyfer on facebook. And I can just tell you how great it is to have a blog friend? I’ve never met her in person, I just stumbled on her blog one day “on accident”, I don’t even necessarily follow the same diet plan as her (yet)… but she has been one of the biggest encouragements to me over these past months as I have struggled and struggled with my eating. I was recently asking her to write a guest post for me about getting motivated/staying motivated and here are a few of our convos. I’m including this conversation because I feel like there are probably several people out there that are also STRUGGLING with this! This post is SO MUCH for me as well… I’m genuinely struggling. My previous motivation of God, between you and me, has just petered out and I just. don’t. care. And I want to care. I know that I NEED to care. But I can’t seem to MAKE myself care. I have crossed over from “sometimes” wanting to indulge, back into an hour-by-hour struggle. Like, I can make it until about noon and then whatever resolve is GONE. Honestly, my “mental” is just… broken right now. But in ALL areas of my life. I don’t really want to parent. I don’t really want to read my Bible. I don’t really want to be a good wife. It’s all just… meh. TERRIBLE!?!?!?! She then asked, If you think it won’t completely derail you, why can’t you take a break? Not necessarily from eating properly, but maybe from beating yourself up when you do make poor choices. And this was when answering her question brought me to my own answer. Not sure… I mean, honestly, I’m hardly following anything of the sort right now. I’m not beating myself up per se, it’s just that I want so bad to be FREE again and I just feel entrapped again. It’s not even necessarily about weight or health. It’s about that freedom from food. I think a big part of it is just what you said… you made a life change. I made a year change and then it all sorta fell apart. That was the problem. I realized it right then. I was still trying to fix this problem with a bandaid. A one-year bandaid. A five-year bandaid. But what it needs is a LIFETIME healing! Okay God. Let’s start over. Let’s go back to the beginning. A Daniel Fast. A little one. Four days. I’ll get some people to do it with me and I will open my heart to You to show me what to do. In a little four-day Daniel Fast.